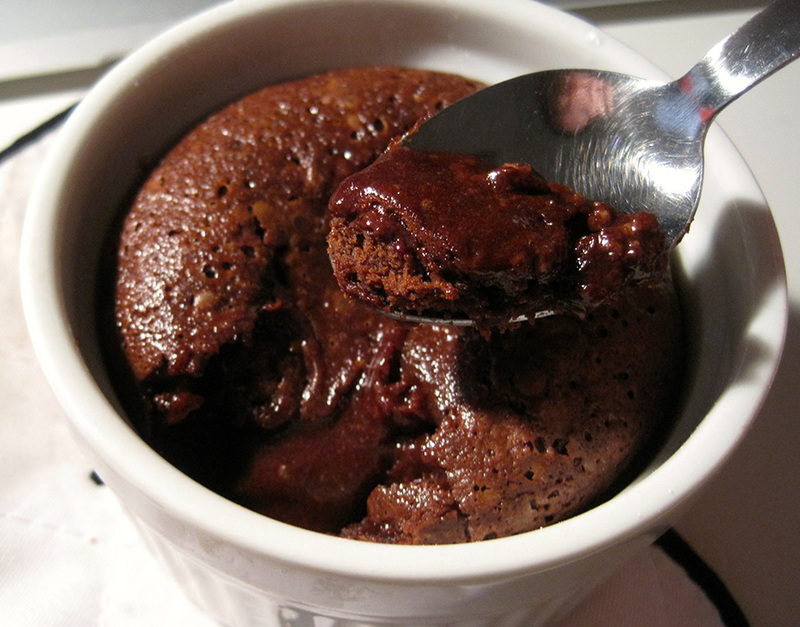 I’ve known in the back of my mind how simple molten lava cakes are to make, but can you believe that I’ve never actually attempted this half-baked ubiquitous restaurant concoction? Now I have. And it’s actually really easy! The small amount of flour involved also means that the quality of the cake wouldn’t suffer too much with the substitution of gluten-free flour. I used a Paula Deen recipe, fully well knowing that it would be excessively rich, which is why I third the recipe to create two ramekins worth of molten lava cake instead of six. And even then, each portion was way too rich for me – I ate it in fits and starts, and each ramekin took approximately three tries to finish. Whew. Grease 2 (6-ounce) ramekins. Melt the chocolates and butter in the microwave, or in a double boiler. Add the flour and sugar to chocolate mixture. Stir in the eggs and yolks until smooth. Stir in the vanilla and orange liqueur. Divide the batter evenly among the ramekins. Place in the oven and bake for 14 minutes. The edges should be firm but the center will be runny. Run a knife around the edges to loosen and invert onto dessert plates.